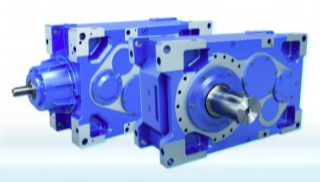 Industrial gear units are drive technology heavyweights which need to handle large torques. Due to the large forces involved, small defects which are not detected in time can quickly result in complete breakdowns. This would not only be expensive, but potentially disastrous: major plant components would remain at a standstill until a replacement was delivered and installed. Because of this, Nord Drivesystems uses condition monitoring and predictive maintenance to achieve maximum plant availability and high cost-efficiency. While condition monitoring only enables the state of wear to be detected, predictive maintenance can ideally enable a maintenance date to be planned well in advance. This means higher plant availability, reduced costs, longer service life of the drives, and above all no unplanned downtimes - an ideal concept, especially for industrial gear units, as these are often used in highly complex plants, in which downtimes would have particularly serious consequences. which is determined from the measured electrical data. This allows an assessment of the degree of use of the gear oil and the predicted date for the oil change. For industrial gear units, physical temperature and vibration sensors are both economical and advisable. In particular vibration sensors offer a range of advantages. Detailed manufacturers' databases exist for all of the bearings which are installed in industrial gear units. These databases contain the characteristic vibration frequencies for all components of each bearing type. The individual frequencies can therefore be clearly identified and attributed to particular components. The frequency spectrum can be analysed on the basis of the time signal or an FFTanalysis (Fast Fourier-Transform). This not only enables the ideal or necessary maintenance time to be calculated, it also indicates the location of the fault and which replacement parts are required. The autonomous drive communicates its status data to a secure cloud. There, this data is available for analysis with filter and analysis tools, so that monitoring of the drive units can be carried out from anywhere in the world. The data are transparently presented in a browser-based web interface and the plant can be viewed at a glance in a clear 3D illustration.